And I basically agree on where he's coming from. But he's telegraphing the wrong message. The Islamists want nothing more than for people to stop criticizing them and offending them. 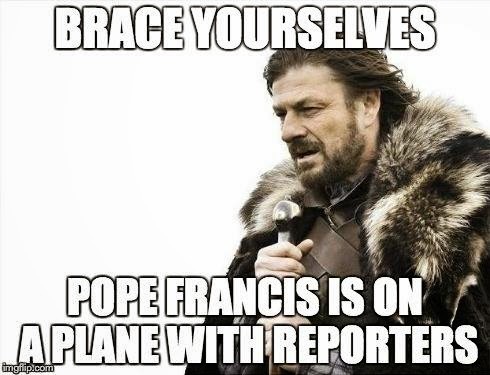 The Pope's message dovetails with this objective. They hear that we should kowtow to Islam and respect their faith. And that's the last thing we want to encourage. We must communicate the message: we're going to do whatever the heck we want and if you try to enforce your will on us, we will resist. Pope Francis' statement will be used to shut down Catholic criticism of Islam. You can see the distortion coming from a while away: Your statement about Islam is insulting, Pope Francis said you can't insult us, so shut up! Now I agree that generally, we should not mock people's faith, or insult others on purpose. For somebody trying to live up to holiness, this poses a bit of a dilemma. Because the dynamic of the conflict demands that we resist Islamicization, and by definition, that must include saying something offensive to defend our freedom. With freedom, you use it or lose it. On the other hand, spreading mockery and insult can be toxic to the soul. The Catholic then has to walk a fine line between preserving freedom through harsh critique, and falling into invective. We can't just capitulate in the face of Islamic aggression.And we can't play nice and not expect the Islamists to take our niceness as a sign of weakness. We have to continue calling out Islam on its errors and the bad behaviour of its adherents. Objective truth will offend people. But sometimes it's necessary to do that.